The Southtown Star is reporting that a 69-year-old Blue Island man who was struck by a car was killed while bicycling in Alsip. Encarnacion Solano was first injured when his bicycle and a car collided Thuirsday afternnon at the intersection of 123rd Street and Springfield Avenue in Alsip. Images of the intersection show a "T Intersection" where Springfield runs North-South and dead ends at 123rd Street which runs both direction East-West. This incident has been ruled an "accident," but that determination means that the medical examiner ruled out homicide or suicide as the cause and did not believe there to be any intent of either party. Further details of the collision were not available. 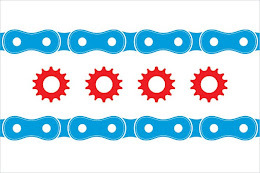 If you have any questions regarding this post or an issue involving Illinois Bicycle Law, please contact Illinois Bicycle Attorney Mike Keating at 312-208-7702 or MKeating@KeatingLegal.com. All initial consultations are confidential and free.